We would like to take this opportunity to briefly introducing EUROBOND – Bonding with the Best. Introduced by EURO PANEL PRODUCTS PVT LTD. EUROBOND Aluminium Composite Panel is dedicated to Manufacturing & Developing Aluminium Composite Panels and Innovative Metal Composite Panels. Committed to QualityWe are committed to improve our quality procedures continually, to guarantee that every aluminium composite panel / sheet or aluminium cladding sheet / panel that comes through our manufacturing process is of the highest quality and meets industry standards. We take pride in informing our customers that at Eurobond we have one of the best laboratory set up in India to gauge testing parameters effectively and ensure that we produce quality outputs consistently. We use Alloy 3003 as part of our manufacturing process. The use of Alloy 3003 ensures high strength and increase in life of the ACP. Also Alloy 3003, provides high impact resistance and easy maintenance. Our quality procedures coupled with skilled engineering practices makes us one of the leader aluminium fabrication and building materials company in India. Customer Centric ApproachAt Eurobond, our business strategies are aligned with the expectations of our customers. Company's production lines are built to provide flexibility to our customers. Our new production facility at Umbergaon is one of the best Aluminum panel sheet plant in India. The modern machinery at plant allows us to use coils thickness from 0.04mm to 1mm and ACP thickness from 1mm to 6mm, allowing us to cater to different demand. Adapting to a customer centric approach, the company has built flexible lines to produce ACP with width from 3feet to 5feet. Also the standard length available with us as ready stock anytime is of 8feet, 10feet and 12feet. For any specific length requests, we are always ready to cater. 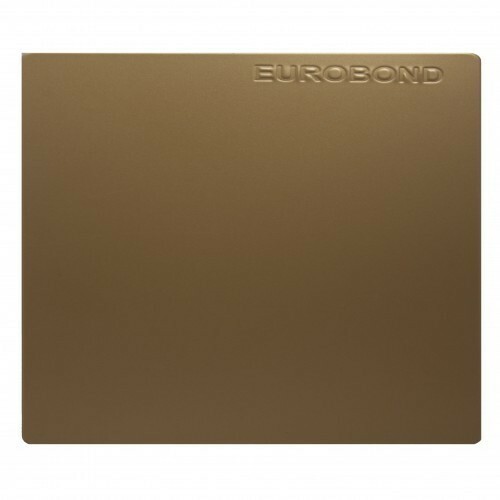 Eurobond panels come in wide varieties of colour, design, texture and material. This ensures that we are not just improving the quality of the panels but significantly improving the aesthetics and appearance of the structures around us. Our motto is to contribute in improving the standards of the building industry in India and World. EUROBOND – Bonding with the Best. Introduced by Eurobond ( Brand Of Euro Panel Products Private Limited ). EUROBOND Aluminium Composite Panel is dedicated to Manufacturing & Developing Aluminium Composite Panels and Innovative Metal Composite Panels.